Two weeks, three rivers, countless memories... of a glamorous private evening in a Viennese palace with dinner and a musical performance... wine tasting in a palace cellar in Würzburg... your Hungarian guide in Budapest who tells tales of two cities now joined as one... personal stories shared by a fascinating Slovak resident in Bratislava... an abbey in Melk chronicling 900 years of history... excellent musicians onboard ship... dining ashore at local restaurants... a private canal cruise in Amsterdam... and learning about world-famous art with an expert. It’s all included, all uniquely Tauck. Your Rhine cruise starts at 4:00 PM in Amsterdam, Netherlands. A transfer is included from Amsterdam's Schiphol Airport or Central Station directly to your riverboat. Enjoy a welcome briefing and a leisurely dinner as you settle into your floating hotel for a memorable two-week-cruise on the Main, Rhine and Danube Rivers. Amsterdam... the name itself conjures up images of the Dutch capital’s myriad cultural treasures, from gabled houses, markets and cafés to awe-inspiring museums housing a treasure trove of world-famous art – and it’s all yours to enjoy today. Your guided tour of the famed Rijksmuseum is really inspiring – a firsthand look at Rembrandt’s masterpiece The Night Watch is like meeting the artist himself, and you’ll love seeing acclaimed works by other well-known “Old Dutch Masters.” Once an exclusive royal privilege, a private sightseeing cruise by canal boat on the city’s network of concentric, tree-lined 17th-century canals provides a unique view of Amsterdam’s blend of architectural styles – they date all the way back to medieval times – and a unique taste of daily life in this easygoing city. Join us for a welcome reception and dinner tonight as we chart a course to Germany. After a morning of cruising and lunch aboard the riverboat, your explorations continue in Köln (Cologne), the oldest city in Germany. A guided walking tour of city sights includes a visit to twin-spired Kölner Dom (Cologne Cathedral), boasting one of the world’s largest church façades; it is one of Europe’s most beloved Gothic cathedrals. You’ll have some free time to wander through Cathedral Square and the Hohe Strasse pedestrian area in the afternoon. Dinner aboard ship tonight is followed by an onboard performance by local musicians. The perfect Rhine cruise... glide along the river until early afternoon, and relax as your Tauck Director shares a tale or two during the cruise through the scenic – and literally legendary – Lorelei Valley, a UNESCO World Heritage Site. Arrive in Rüdesheim, where an entertaining lunch in a local German restaurant with an old-world ambiance precedes a visit to Siegfrieds Mechanisches Musikkabinett, an eclectic collection of mechanical musical instruments housed in a 15th-century castle in Rüdesheim, followed by free time. Walk back to the ship or ride the mini train; enjoy dinner while cruising the Rhine tonight. 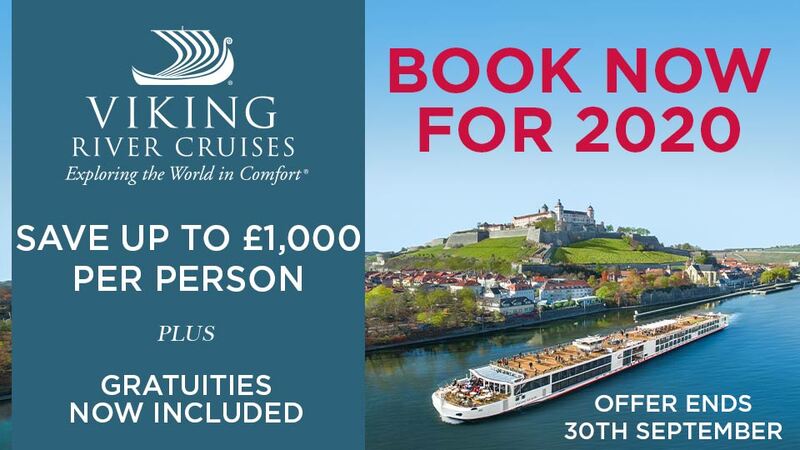 Enjoy the views as your Rhine cruise continues into the Main River, for a full day of cruising through scenic valleys studded with castles, cathedrals, and fortified towns. Enjoy a Bavarian-themed dinner aboard the riverboat tonight. 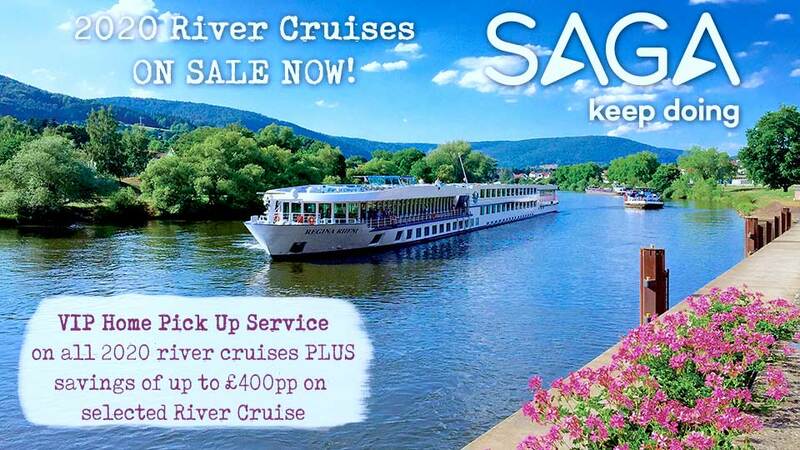 Spend the morning cruising and have lunch aboard the riverboat before arriving in Würzburg for choice of sightseeing. 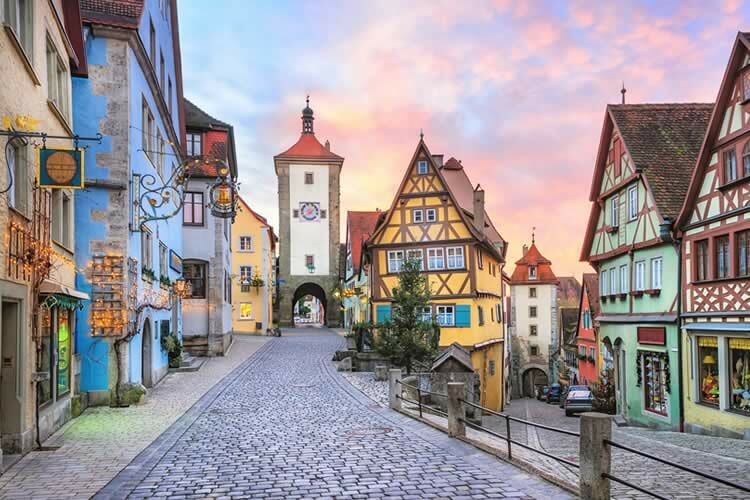 You can choose an excursion to medieval Rothenburg, on Germany's "Romantic Road," to see its Gothic cathedral and gabled houses on a walking tour, and enjoy some free time. Or stay in Würzburg and visit its famous Residenz, where the town’s prince bishops lived from 1744. One of the largest and most beautiful Baroque palaces in Germany, it was built and decorated in the 18th century by an international team of architects, painters, and sculptors, and is today recognized as a UNESCO World Heritage Site. Later, all will gather in Würzburg for a wine tasting, then return to the riverboat for dinner aboard ship followed by entertainment. Your riverboat cruises along the Main to the Bavarian town of Bamberg, a UNESCO World Heritage Site situated atop seven hills. After discovering the town’s lovely gardens, medieval architecture and 13th-century Gothic cathedral with its four imposing towers on a guided walking tour of Old Town, you'll have time to explore this charming town on your own. Back aboard the riverboat, enjoy a barbecue dinner on the Sun Deck tonight, weather permitting. Tauck's Main, Danube and Rhine cruise arrives this morning in historic Nürnberg, where you'll have a choice of a walking tour through Nürnberg’s medieval ramparts to the Imperial Castle and the old city, or view the Courthouse, Zeppelinfeld rally grounds, and other sites associated with World War II and its aftermath, and visit the Documentation Center. Your riverboat negotiates the Main-Danube Canal today, which ultimately links the North Sea with the Black Sea – and which you'll learn all about from a local expert during your transit. The idea goes back as far as Charlemagne, but wasn't realized until this canal was completed in the 1990s; pass through 16 locks as the waterway traverses the mountains. Attend a gala dinner aboard the riverboat this evening. With its roots as a Roman encampment on the Danube, the quintessential Bavarian town of Regensburg is home to more than 1,400 original historic buildings. Walking here is a delight and is the only way to view the sights up-close. A local guide will lead the way as you see the town’s 12th-century Steinerne Brücke (Germany’s oldest surviving stone bridge), the 15th-century Altes Rathaus (Town Hall), the towering Dom St. Peter, and the remains of the Roman wall. Visit the princely house of Thurn und Taxis on a guided tour, followed by free time. Enjoy an onboard musical performance by a local quartet before your ship sets off for Passau. The riverboat docks in the port city of Passau, dating way back to Roman times. Spend time exploring this lovely Bavarian town – well-known for its Baroque architecture including unique four-story homes, scores of churches and marvelous stained glass – on a walking tour; inside St. Stephan’s Cathedral, you’ll see (and maybe even hear) the largest pipe organ outside of the U.S. (and the world’s biggest cathedral organ). Listen to commentary from your Tauck Director and take advantage of other activities as you continue your Danube, Main and Rhine cruise in the afternoon, bound for Melk, Austria. This evening, enjoy a musical performance by a classical trio. Your next destination is the town of Melk, Austria, where you'll step back in time on a guided tour of its 900-year-old Benedictine Abbey, perched on a rocky outcrop above the river. Inside this Baroque masterpiece are fine frescoes, early manuscripts, and a high altar. Back aboard the riverboat, enjoy views of castles, vineyards, small towns, monasteries and medieval ruins while cruising through the Wachau Valley toward the magnificent Austrian capital city of Vienna. Tonight, a Tauck Exclusive – a private, gala Imperial Evening in the 18th-century Baroque Palais Ferstel in the heart of the city, featuring a sumptuous dinner and live entertainment – just might sweep you off your feet! Get an overview of Vienna, Austria's capital and one of Europe's greatest cities, with a morning sightseeing tour of this historic former capital of the Habsburg Empire. Take your choice of a tour of Schönbrunn Palace, the Habsburgs' vast "summer residence" built to rival Versailles, or a guided visit to the Sisi Museum and the amazing Imperial Apartments inside the Hofburg, the Habsburg family's former royal palace that today is the official residence of Austria's president. Explore the city as you wish this afternoon, or return to the riverboat; dinner is aboard ship tonight. Depart Vienna after breakfast, and spend the morning cruising to Slovakia. Arrive early afternoon in Bratislava, capital of Slovakia, where 17 centuries of history are chronicled on a walking tour led by a local guide. Highlights include Baroque palaces from the Habsburg era, St. Martin's Cathedral and more, and a visit to Old Town Hall. This evening, a taste of Slovakia with a Slovak dinner followed by entertainment aboard the riverboat; set off for Budapest tonight. Tauck's memorable Amsterdam to Budapest river cruise arrives at your final destination – Budapest, Hungary's remarkable capital. Standing on opposite banks of the Danube, Budapest’s two distinct sections – Buda and Pest – were once independent cities. Discover both on a day of sightseeing that includes views of patriotic Heroes’ Square in Pest, dominated by statues of great leaders from Hungarian history; the Gothic-Revival Parliament building, an iconic feature of the Budapest skyline along the Danube; and Fisherman’s Bastion, standing watch like a sentinel over the river. Spend the afternoon exploring on your own. Join us for our farewell reception and dinner tonight onboard ship. Your Amsterdam to Budapest river cruise ends in Budapest, Hungary. Disembark in Budapest; a transfer is included from the riverboat to Budapest Ferenc Liszt International Airport and Budapest Keleti Railway Station. Allow 3 hours for departure flight check-in. All private Tauck shore excursions – £800 Value!